The high quality and reliable Multiple Spot Thermometer (MST) measures temperature with a number of PT 100 spot elements placed at different heights to provide a tank temperature profile and an average temperature. Only the fully immersed elements are used to determine product temperature. The spot elements are placed in a flexible gas tight protection tube made from convoluted stainless steel. A flange can be attached to a top fitting and the tube can be anchored to the bottom. The MST is easy to install, even if the tank is in service. In pressurized tanks the MST can be installed in a closed thermowell so that it can be removed for service or inspection while the tank is in operation. 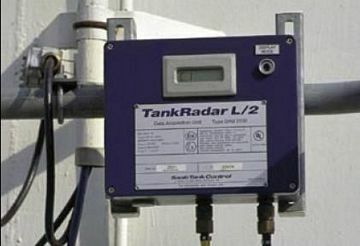 For LPG tanks, single spot temperature sensors in thermowells are used. A water bottom sensor can be integrated in the MST. Directly into the RTG with common return connection (up to 6 temperature elements). Via the DAU (up to 14 temperature elements).